This tranquil master bathroom awakens the spirit, soothes the senses and brings the ancient ritual of Japanese soaking to the modern environment of a young professional couple remodeling their whole home. Working within the existing space of the original master bathroom, the room was significantly reconfigured. The toilet/water closet room and shower space were merged, some windows were removed and some repositioned. 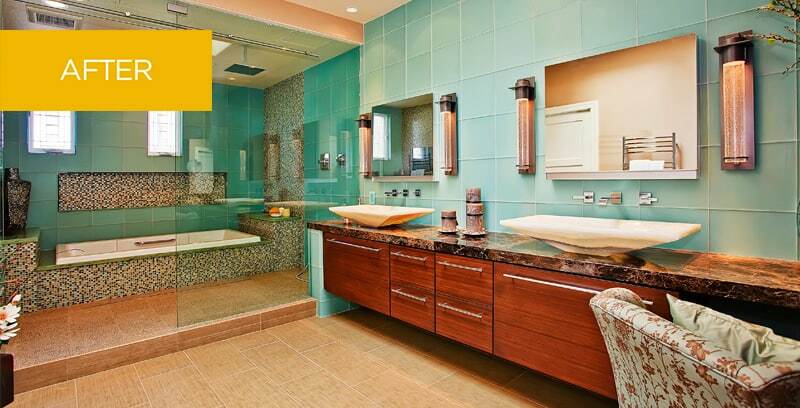 The result is a bathroom that seems far more spacious and serene. The Japanese soaking tub is a central facet of the design. The wife is Japanese and it was particularly important to her to bring the custom of her heritage into the couple’s new space. Japanese bathing differs from the American version in that the tub is used for much longer and more as a place of contemplation and reflection after getting fully clean in the separate shower. The tub contains no faucet as water is filled from the tub overflow. The new master bathroom is a peaceful retreat for a young couple looking to combine ancient tradition and modern style with an imaginative interpretation.